Common mergansers participate in sexual reproduction. 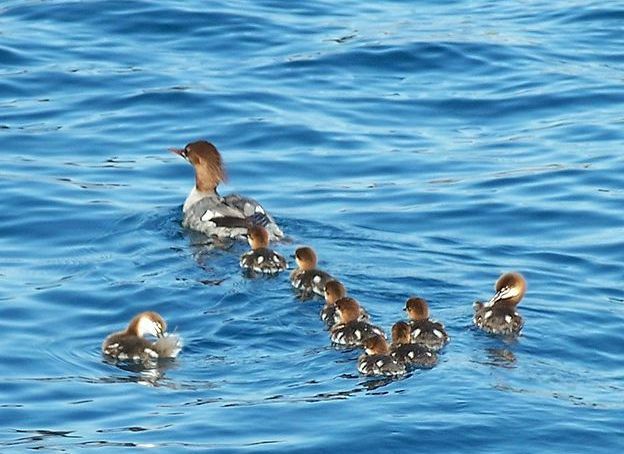 Both the males and females of common merganser reach sexual maturity around the age of two. Mates are selected during late winter. The males court the females by circling them and displaying courtship posture. The male extends his neck with the head feathers erect and makes a distinctive guitar-like sound. A lot of chasing and fighting goes on between males during courting times. By spring time, mates are selected and the birds are ready to fly north to the breeding sites. The breeding grounds are primarily in the northern portion of North America, Europe, and Asia. Breeding usually begins sometime around May and June. Common mergansers prefer to nest in hollow trees along the shore lines. When such areas are limited, females will build their nests on the ground, on cliff ledges, under heavy vegetation, or even in abandoned buildings. Each female can produce anywhere from five to fifteen eggs. Usually each clutch contains seven to nine eggs. The average size of the eggs is 64.3mm by 44.9mm. Common merganser eggs lack luster and have a pale ivory-yellow color. The hatching time can be anywhere from 28 to 35 days. After the eggs hatch, the young birds will follow their mother to feeding sites. Right after the young leave the nest they can swim and obtain food very easily. By day eight, the young birds are excellent swimmers and divers. Mothers typically abandon their young 30 to 50 days after hatching, before they develop the ability to fly. The males will leave the breeding grounds once incubation begins. 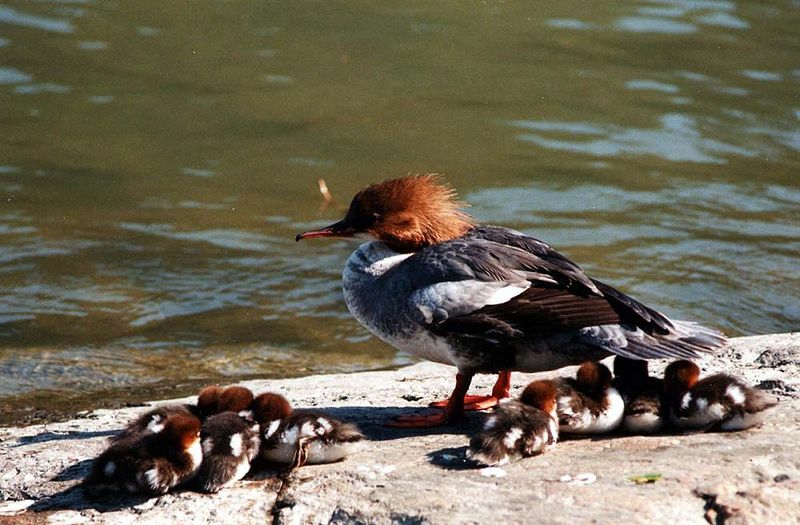 Young common mergansers are very independent and receive very little parental care.